2010 Fathers Day. The end of June, near the town of Abiquiu (Ab ih kuu), north central New Mexico. I was out walking. Wasn’t talking. Just observing. Soothing wind tunes. Calming earth tones. Warming sun rays. The scent of ceder. When life and stress and time collide or illness stalking at my side, I take a peaceful walk outside, to peel away the layers and open up my mind. The healing power of Mother Nature lies within the organic curves and shapes and folds awaiting to embrace me. The healing then begins when I in turn embrace my mother, Nature. 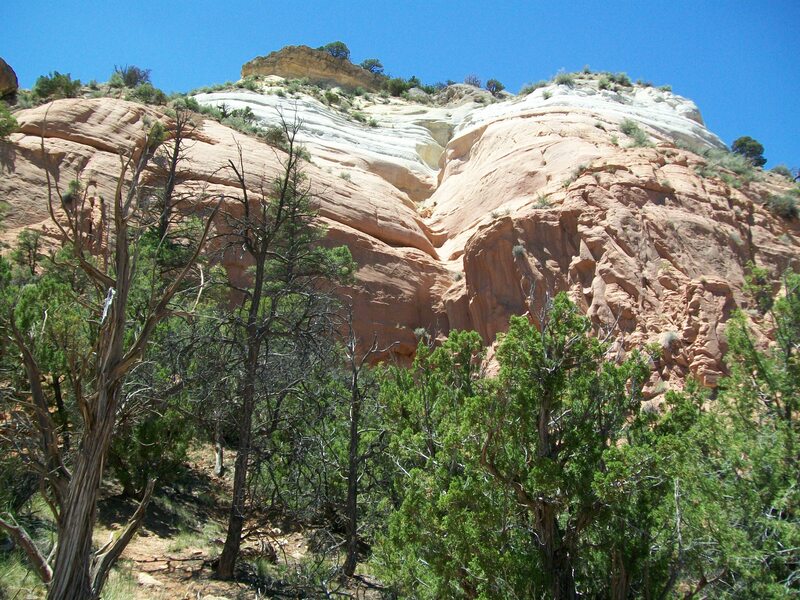 The geology around Abiquiu is clock and calender for the world and a magnet to artistic talents, curious minds and for scientific inquiry. No pretty blanket of flowers here or forest shawl. Mother Nature lifts up her skirts exposing time and age for what they are and therein lies the story. The geologic history of the area around Abiqui is delightfully complicated. 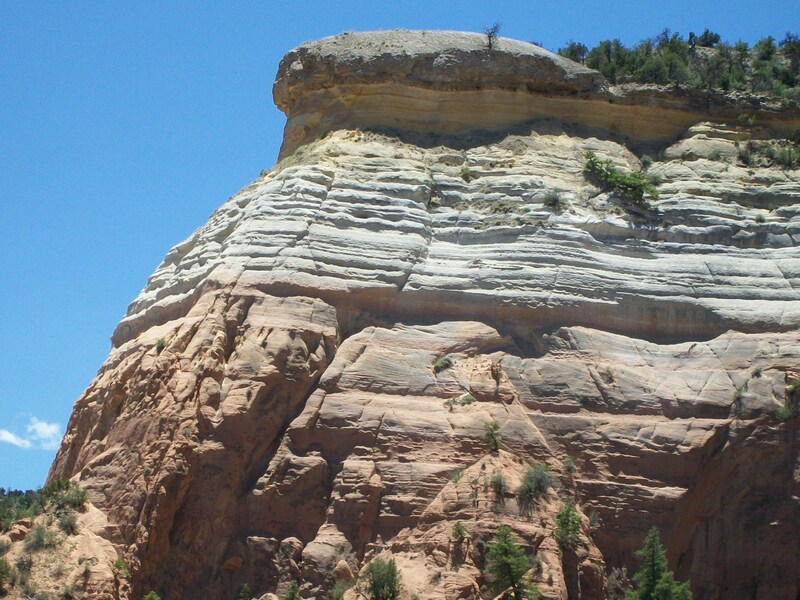 There are old basaltic Precambrian rocks that are 1,693 to 1,760 million years old that were covered by sedimentary deposits, buried, deformed and then uplifted to be exposed at the earths surface again 1,300 million years later. That was during the middle Pennsylvania Period 315 million years ago they were exposed, while the Ancestral Rocky Mountains were eroding and under deformation and the super continent Pangaea was just forming. A time when all continents drifted and collided, forming one shaped like a C. Mudstone and sandstone from the Triassic (200 million) and Jurassic (150 million) periods are shown in the photograph above and the cliffs are capped by Cretaceous deposits of 100 million years ago. Which is when the eventual rift and breakup of the super continent Pangaea left the current configuration of continents as they are today. 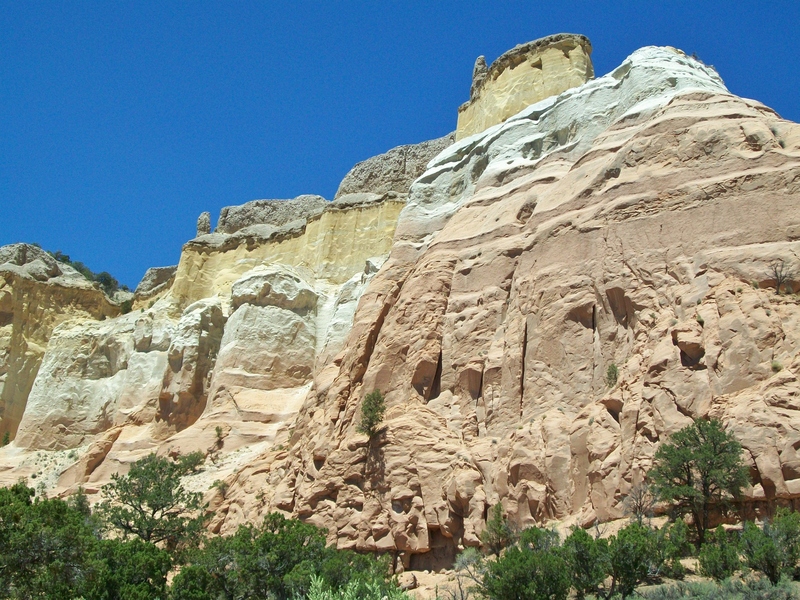 Abiquiu is an old and ancient bit of land. It is an honor to walk and explore such places. Aloha on your Adventures in Time and Space. This entry was posted in environment, history, Nature, the hungry brain and tagged environment, hiking, history, nature, photography, science. Bookmark the permalink. 14 Responses to Pangaea exposed. Aloha Jan, good eye. I was up at the echo amphitheater early that day which is where these photos were taken. Later I was over at the ranch enjoying but did not post anything from there. 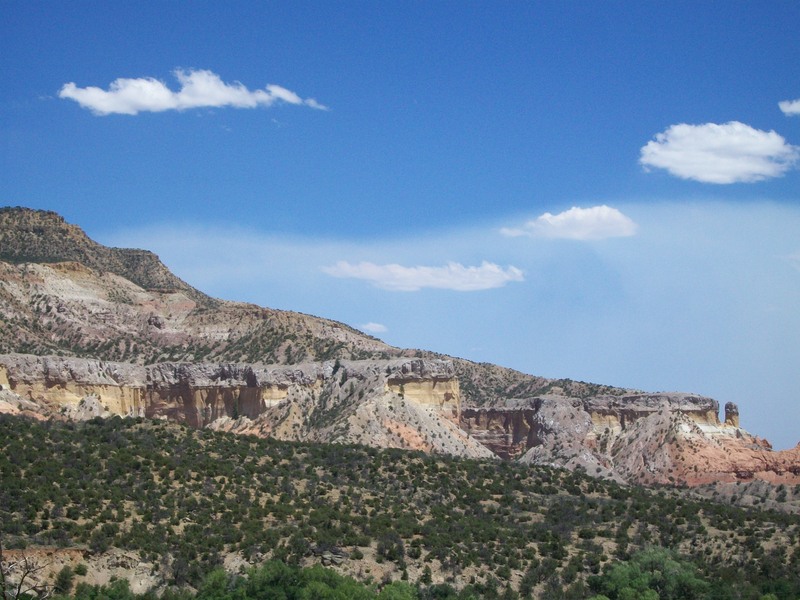 Love it around Abiquiu myself…and the rest of N.M as well. Beautiful photos of Nature in all her beauty. Thanks for your thoughts & interesting ancient history. In Florida there are no rocks – your photos were very soothing to my soul. I feel quite refreshed after reading that. And informed, as well. What a beautiful landscape – so different from my own. Thank you for the photos and words of wisdom. The Muir quote (“In every walk with nature one receives far more than he seeks.”) is one of my favorites. Love your images. Thank you Ken. It is true that every small adventure I go on I discover much more than I anticipated. That is what makes it an adventure I suppose. Thank you! I knew where you were before I read it. I haven’t been to Abiquiu for a while but it feels my soul’s home. 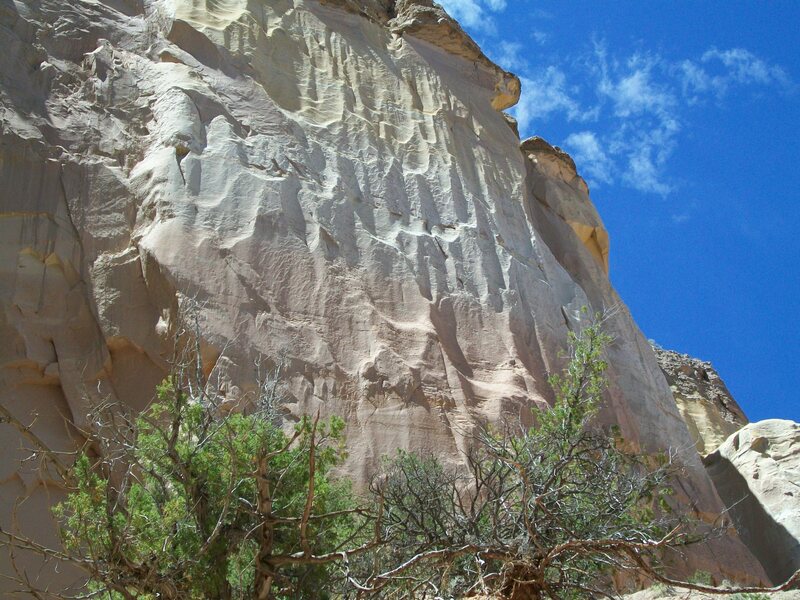 Were you at Ghost Ranch? I had a lovely walk with you. Thank you.